Brainstorming is using our collective brains and ideas to answer a question or solve a problem. Bringing a small group together to tackle and issue that is important all of you to jointly address a problem can have many benefits. Having a few ground rules will go a long way towards making your brainstorming session both productive and actually enjoyable. To start: send out the question or problem in advance and let people think about it. Choose only one thing to focus on, not several. What would be an approach to……. 1. The First, and Biggest Rule : no negative feedback. This is the time to acquire new ideas, different ideas or creative ways to connect elements. This is not the time to be judgmental or negative. 2. Second Rule: Clearly define the question or problem to be solved. As ideas are suggested: someone needs to keep track of them and record them. Be sure you know who this will be in advance. 3. Third rule: there will be no criticism or debate for any idea. There will be no critique of the ideas, no discussion at the time of the session. Keep track of ideas and suggestions, record them and then review later. 4. Fourth Rule: encourage everyone to contribute, the more the merrier. Create a supportive and inclusive atmosphere, encourage everyone to contribute. 5. Fifth Rule: Do some of these ideas connect? Sit back and take a look at what you have accumulated, don’t judge, just look. Do some of the individual ideas connect to each other? Could some of them be reconfigured to work together? Does something jump out? Once all the information has been collected and sifted, review and share with the participants- get their feedback; what answers the question you asked? 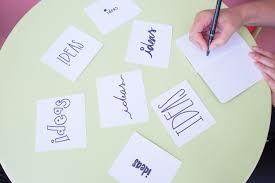 Brainstorming can add a new energy to the issue you are addressing, give you new perspectives on how to more successfully attract attention, communicate with your constituents and stand out. If you are well organized, you may well get a lot more than you anticipate, give it a try.